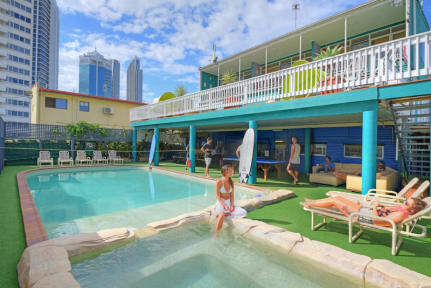 Backpackers In Paradise Resort i Surfers Paradise, Australien : Boka nu! All groups must confirm with hostel before booking. We do not accept schoolies. Backpackers In Paradise har ett perfekt läge, bara en två minuters gång från busstopp, tramstopp med mera, stranden, klubbar, restauranger och turistattraktioner. Gratis: WiFi* upphämtning vid busstationen, rena lakan, pool, spa, hängmattor, body boards, pingpongbord, soldäck, solkräm, filmer, sportkanaler och grillområde. Fastigheten inkluderar eget badrum inne i alla rum, rum för endast tjejer, ett café, bar, biorum, en 15 meter stor pool, internet dygnet runt, biljardbord, cyklar, uthyrning av surfbrädor, turistinformation och kvällsunderhållning och nattklubbar. A great hostel! The rooms are clean and the pool is really nice. The atmosphere in this hostel is amazing and I found a lot of new friends during the couple of days I stayed there. Will definitely stay here again when I go back to surfers! 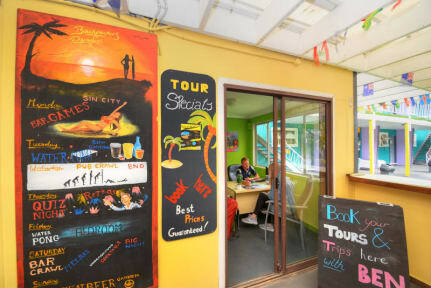 The location is great, close to food stores and just a couple of minutes walk to the Main Street of Surfers Paradise. Nice and fun vibe at the hostel, friendly staff. Stayed in the 20 bed dorm and it was actually very nice, considering the amount of people in the same room. Bathrooms were a little dirty and no soap available... Okey free breakfast! Really great hostel in surfers! The room was clean, kitchen facilities were good and the atmosphere was great! Such a good hostel with very kind and nice staff. They are cleaning the rooms every day. Close to everything, bars, clubs, coles, woolworths, the beach ect. So good atmosphere!! Worth the money!!! Overall a good hostel! The kitchen was clean for being a hostel and the rest of the hostel was cleaned every day. Our room had a aircon witch was nice. The hostel has a nice pool area to enjoy the sunny days! Overall it’s a good hostel for the price. Nice staff, good location, good vibe - a party hostel. Two downsides was that the room was so hot ( only one fan in the room but that didn't help), and we had cockroaches in our room; disgusting. But overall a good hostel. The location of this hostel were really good. The kitchen was clean and pretty big. The rooms were good EXCEPT for the cockroaches which were are huge problem in our room. They were everywhere! They were all over the floors and on everyone's stuff. The overall vibe in the hostel was good! It was a partyhostel but not too much. The staff was not unfriendly but not that welcoming either. The kitchen was too small and you didin't always find the equipment you needed. The dining area was cozy and spacious. The rooms were spacious but didn't have proper lockers. It was a bit dirty some times. Har bott på många hostel i Australien, men detta var sjukt ofräscht. Och då är inte jag kräsen. Men att det springer kackerlackor i köket bland allas matvaror, luktar unket i kylskåpen, läcker från fläktar och en katt som stryker omkring överallt.. kommer inte bo här igen.